On a slightly lesser scale, both in volume and socially, the two landlords of private property on the west edges of the Heath: the trustees of Morden College and the Ashburnham family saw opportunities for investment. The establishment of the Hospital for Seamen in Greenwich, the Royal Observatory, and increasing industry along the Thames at neighbouring (but less socially attractive) settlements encouraged a new population requiring places to live. London merchant John Morden had founded Morden College as a refuge for merchants who were also communicants of the Church of England, and who were down on their luck through no fault of their own. 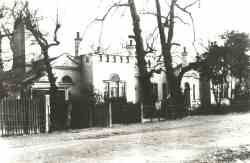 Morden (1623-1708), a Levant merchant, lived at Blackheath from 1669 until his death. He had no direct heirs and he and his wife Susan arranged to establish a Hospital or College at Blackheath in their lifetimes. It was built on the south east corner of the Heath and opened in June 1700. Before that date Morden (later Sir John) had acquired considerable land in the area including a number of parcels collectively known as the Manor of Old Court or the �Queen�s Lands�. At least three of these plots faced the Heath. They were to prove extremely profitable for Morden�s trust that was established in his lifetime to support the College after his and Lady Morden�s death. The trust and the College flourish today. The principal section of the Morden College estate was land at the north west end of Blackheath Hill, and part of West Grove. By the 1740s the College trustees had not only granted develop-ment leases for the land but retained sufficient equity to support its investment. Surveyors and, later, architects were appointed to supervise the repair and management of the buildings, mostly substantial houses for middle class professional or retired people, for future generations. As a result the surviving structures on the College estate at the east end of Blackheath tend to date from the late 18th century although there may be an even more antique core within some of them. Although it was not a commercial development in any sense of the word, mention has to be made here of Vanbrugh�s Field. When Sir John Vanbrugh (1664 - 1726) was appointed architect to the Seaman�s Hospital buildings at Greenwich (later the Royal Naval College and now the University of Greenwich and Trinity College of Music) he bought a plot close by on which to build his own house. Along with his Castle (on the corner of Maze Hill and Westcombe Park Road) he built a �mediaeval village� to provide houses for some of his relatives. 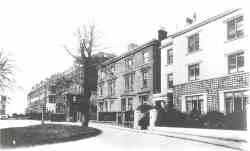 The Vanbrugh buildings dominated this part of Blackheath from the 1720s to the late 19th century when all but the Castle were demolished for the Edwardian suburban road which occupies the land today.